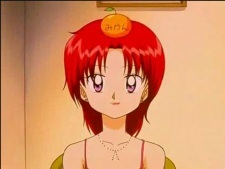 A budding mangaka (manga artist), Mikan often has a tangerine on her head (same goes for the rest of her relatives, even her pet Scottish fold cat) and is a very good friend of Kanata and Miyu, both of whom she often helps out and who have also helped her once with her manga. She has a handsome young brother, Mizuki Yamamura, who was the inspiration of one of the characters in her manga, and often helps her out. Mikan is often panicking because of her deadline and often comes to Kanata's house for consolation, having a few close calls to finding out Miyu and Kanata's secret. Mizuki pointed out that Mikan never gave up on her dream on becoming a manga artist, despite her father's wishes on her becoming a baker. So far, Mikan has shown to be a quite popular with her career. Although Mikan looks plain, stressed, even comical most of the time, she is actually very good-looking when with makeup or when she's relaxed. Her name is a play on that of the manga's author, Mika Kawamura. Interestingly, Mikan means " Tangerine" and Yama means "mountain" although the word Yamabuki means " orange-yellow."